I was given my first hunting dog at the age of 14; he was a Labrador Retriever, undeniable the most popular hunting dogs of all time. However, as some of my first training efforts attest, success was not immediate, however I did develop the love of working with dogs. During my college years, I was a member of Labrador Retriever Club of Southern California, where I devoted my labor on weekends at the club functions. It was there where I received my first formal guidance in hunting dog training. I had opportunities to work alongside a few of the most talented amateur trainers of that era and with their help, I finished six (6) Labs as AKC Master Hunters. These dogs also faired well at the regional level field trials, but my growth potential was limited by the lack of disposable income. At that time I could only afford to compete at the local level. Since then I have taken on dogs from all walks of life, including working with the under privileged as well as dogs that are more naturally gifted. Through these direct associations and from my experience, my belief is that not all dogs learn the same way or at the same rate. Traditional, harsh, “cookie cutting” style of training are predictably distress many a dog, simply because they were not born to fit that program. However, given the right opportunity, I know these dogs could have developed to their fullest potential. I also realize to be successful as a training professional, I personally have to be able to adapt to each dog, I must be capable of delivering training in multiple dimensions and I must continuously fine-tune my skills to be a better trainer each day. Before turning professional, I received coaching in apprenticeship programs offered by legendary trainers such as Bill West, Dave Walker and Rick Smith. Since then, I have structured my techniques solely based on the silent training method with my own path of a “gentle hands” approach and of course, the practical experience I developed over the years. With the success in my early profession in the high-tech industry, came the financial support needed to expand my passion for bird dogs. Ultimately, in 1997 we moved to Colorado and started Godfather Gundogs. In the spring of 1998, we came to the conclusion that developing, campaigning and breeding pointing dogs are the definite of our focus. When we made that commitment, it also became our passion. My passion grows even stronger today; I've never been more alive and devoted as a trainer and breeder, because my love for these dogs. My responsibility for training and developing dogs is not a chore, rather an enjoyment. I grew up in Southern California, where my love for quail hunting and the outdoors were firmly established in my teens. In the early years of my life, I worked as a lifeguard and a gunsmith to support my leisure pursuit. I earned a bachelor degree in Environmental Science from California State University of Fullerton. Following my graduation, my professional career consisted of a sales executive, a dot-com founder and a member of the board of directors of an Inc. 500 company, and of course, professional dog trainer and handler. In addition to producing and developing topnotch field trail and hunting dogs, my accomplishments as a professional dog handler include over 500 placements in both retriever and pointing breed trials. 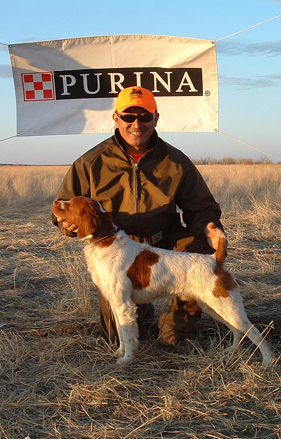 Since 2001 I have won the High Point Award 6 times with 4 different dogs in The Rocky Mountain region NSTRA. I have served as a board member of Rocky Mountain Region NSTRA for over 5 years and I am a NSTRA judge. In addition to being a certified Purina canine nutrition specialist and a premier member of Tritronics Influential Team, I am also an active member of American Brittany Club. My other hobbies include spending time with my family, collecting side-by-side shotguns; specifically European makes and models. My personal library features many museum grade firearms, which many I have personally restored. My name is Steve Chang, and I have lived in Colorado since the spring of 1997. I am multilingual in English and Mandarin Chinese and yes, I still retain a slight accent.